Blessed with an amazing variety of flora and fauna, 67% of the geographical area of Manipur is hill tract covered forests. Depending on the altitude of hill ranges, the climatic condition varies from tropical to sub-alpine. The wet forests and the pine forests occur between 900-2700 m above MSL and they together sustain a host of rare and endemic plant and animal life. Coveted the world over as some of the most beautiful and precious blooms, orchids have an aura of exotic, mysteries about them. 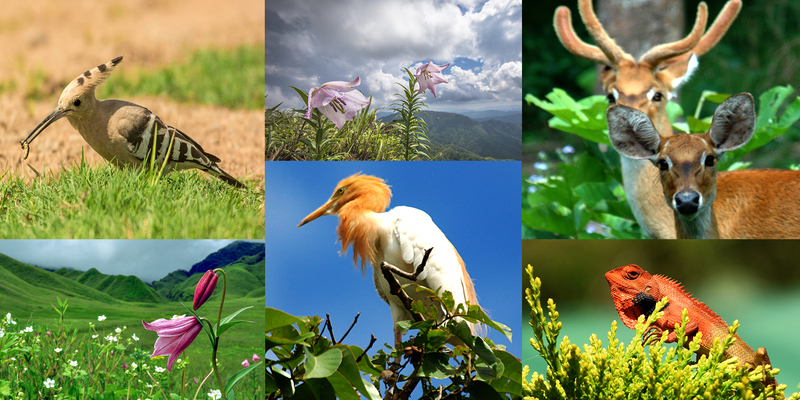 In addition to ‘Siroi Lily’ which is the only terrestrial lily grown on the hill tops of Siroi hill, Ukhrul, the Hoolock Gibbon, the Sloe Loris, the Clauded Leopard, the Spotted Linshang, Mrs. Hume’s Barbacked Pheasant, Blyths Tragopan, Burmese Pea-Fowl, four different species of Hornbills etc. form only a part of the rich natural fauna of Manipur. However, the most unique is the Sangai the dancing deer. The floating mass of vegetation on the Loktak Lake sustains small herds of this endemic deer which unfortunately has the dubious distinction of being the most threatened Cervid (known as Phumdi) in the World. Other mentionable fauna is Salamander known as ‘Lengwa’ found at the foothill of Siroi in Ukhrul. The people of Manipur include Meitei, Naga, Kuki, Meitei Pangal and other colourful communities which have lived together in complete harmony for centuries. These are the people whose folklore, myths & legends, dances, indigenous games and martial arts, exotic handlooms & handicrafts are infested with the mystique of nature. The wonders has no end in Manipur.